Robert B. Chisholm Jr., A Commentary on Judges and Ruth, Kregel Exegetical Library (Grand Rapids: Kregel, 2013). A number of years ago I had the opportunity to take a class that covered Judges taught by the author of this book. In fact, I believe that the class notes were an earlier version of this commentary. The class was excellent. I appreciated Dr. Chisholm’s careful handling of the text combined with his interest in homiletical presentation. These two emphases are reflected in this commentary on Judges and Ruth as well. The commentary on Judges begins with a fairly thorough introduction of 89 pages. Two parts in the introduction are noteworthy. First, the section on the chronological problems associated with the rules of the various judges was very good although I do not agree with the proposed solution. Second, the section on the “modern proclamation of Judges” is helpful for those involved in preaching and teaching this challenging book. Here the author discusses the exegetical idea, theological idea, homiletical trajectories, and primary preaching idea for each section. The introduction to Ruth is 33 pages. I found the discussion on literary structure interesting although I am not comfortable with using dramatic terminology (acts, scenes, etc.) since this might suggest that the genre of Ruth is theatrical and related to ancient drama (a genre that I believe postdates the composition of Ruth). As with Judges, Chisholm provides the reader help with preaching and teaching the book. The commentary proper follows a similar format. Each section of the commentary begins with a translation (a slightly revised version of his translation from the NET Bible) that is parenthetically identified with narrative structure labels (e.g., mainline clauses, offline clauses, and quotations). This is followed by an outline, a discussion of the literary structure, and an exposition of the text. The exposition is followed by a discussion of the message and application of the passage. Here the preacher/teacher is given helpful material from which to craft a sermon or lesson. One will need to have some training in Hebrew to get the full benefit of this work though. 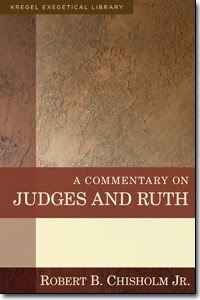 Overall this commentary is an excellent resource for the study of Judges and Ruth. The comments are detailed enough to be helpful but concise enough to be useful. The author is fair and balanced in his treatment of textual difficulties and carefully articulates his preference. Chisholm’s discussion of Jephthah’s treatment of his daughter is a good example of this (pp. 350-65). Also, as noted previously, this commentary is preacher/teacher friendly. Even the chapter titles have a sermonic flavor. Rather than utilizing something as linguistically sterile as “the Samson narrative” for chapters 13–16, this section is cleverly labeled, “Samson: Lion Killer with a Sweet Tooth.” There is not much to offer by way of criticism. My lone suggestion would be a Scripture index. Anyone who is planning to preach or teach through either Judges or Ruth should consider this book, especially if he or she has some facility with Hebrew. You can access a 25-page excerpt here. Thanks to Kregel for providing the review copy used in this unbiased review.